The fringe on this lamp consists cut-out shapes and spirals in anodized aluminum. 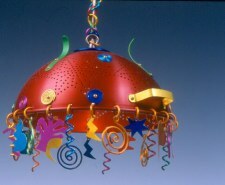 Comes complete with 24" chain in anodized aluminum & 12' of wire with an in-line switch. 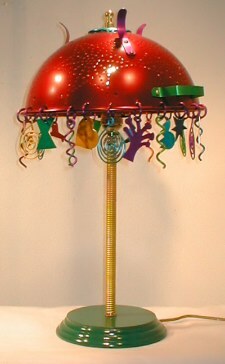 The fringe on this lamp consists multicolored 1" wire balls. Comes complete with 24" chain in anodized aluminum & 12' of wire with an in-line switch. Perfect for a kid's room! The fringe on this lamp consists cut-out shapes and spirals in anodized aluminum. Yellow pipe coil contrasts with the red shade on wooden base* (pipe coil available also in aqua, lime, green, purple, gold,or blue). 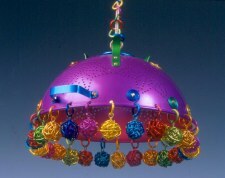 The colander shades come in 3 colors: Red, aqua, and purple (fuscia). The diameter of all the colanders is 11". All lamps take a standard bulb, 60 watts recommended or spot light. The fringe may be collage cut-outs, "pom-poms" or two styles not shown: Measuring spoons and spirals & squiggles. Please contact us for all lamp orders.